Paris (AFP) - President Emmanuel Macron on Friday signed sweeping changes to France's complex labour code into law, ramming through a landmark reform four months into his administration despite protests from hardline unions. But the resistance has been weaker than that faced by Macron's Socialist predecessor Francois Hollande over his more limited changes to the labour code, which sparked a wave of sometimes violent protests last year. 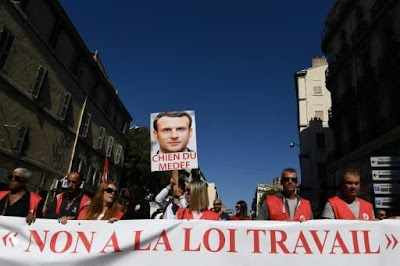 Protesters have seized upon his recent criticism of opponents to the labour market changes as "slackers", with slogans such as "Watch out, Macron, the slackers are in the street".